Fennel, Foeniculum vulgare, is a perennial herb. It is erect, glaucous green, and grows to heights of up to 2.5 metres (8 ft), with hollow stems. The leaves grow up to 40 centimetres (16 in) long; they are finely dissected, with the ultimate segments filiform (threadlike), about 0.5 millimetres (1⁄50 in) wide. (Its leaves are similar to those of dill, but thinner.) The flowers are produced in terminal compound umbels 5–15 centimetres (2–6 in) wide, each umbel section having 20–50 tiny yellow flowers on short pedicels. The fruit is a dry schizocarp from 4–10 millimetres (3⁄16–3⁄8 in) long, half as wide or less, and grooved. Since the seed in the fruit is attached to the pericarp, the whole fruit is often mistakenly called “seed”. Florence fennel (Foeniculum vulgare Azoricum Group; syn. F. vulgare var. azoricum) is a cultivar group with inflated leaf bases which form a bulb-like structure. It is of cultivated origin, and has a mild anise-like flavor, but is sweeter and more aromatic. 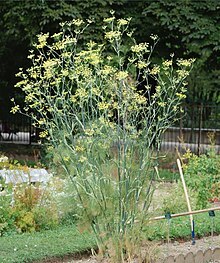 Florence fennel plants are smaller than the wild type. The inflated leaf bases are eaten as a vegetable, both raw and cooked. Several cultivars of Florence fennel are also known by several other names, notably the Italian name finocchio. In North American supermarkets, it is often mislabeled as “anise”. Foeniculum vulgare ‘Purpureum’ or ‘Nigra’, “bronze-leaved” fennel, is widely available as a decorative garden plant. The bulb, foliage, and fruits of the fennel plant are used in many of the culinary traditions of the world. The small flowers of wild fennel (known as fennel “pollen” ) are the most potent form of fennel, but also the most expensive. Dried fennel fruit is an aromatic, anise-flavored spice, brown or green in color when fresh, slowly turning a dull grey as the fruit ages. For cooking, green fruits are optimal. The leaves are delicately flavored and similar in shape to those of dill. The bulb is a crisp vegetable that can be sautéed, stewed, braised, grilled, or eaten raw. Young tender leaves are used for garnishes, as a salad, to add flavor to salads, to flavor sauces to be served with puddings, and also in soups and fish sauce. Most Lomatium species have yellow flowers like fennel, but some[which?] are white flowered and resemble poison hemlock. Lomatium is an important historical food plant of Native Americans known as ‘biscuit root’. Most Lomatium spp. have finely divided, hairlike leaves; their roots have a delicate rice-like odor, unlike the musty odor of hemlock. Lomatium species tend to prefer dry rocky soils devoid of organic material. ^ “Classification for Kingdom Plantae Down to Genus Foeniculum Mill.“. US Department of Agriculture, Natural Resources Conservation Service. 2015. Retrieved 24 March 2015. ^ On tablets MY Ge 602, MY Ge 606 + fr., MY Ge 605 + 607 + frr. + 60Sa + 605b. “The Linear B word transliterated as ma-ra-tu-wo”. Palaeolexicon. Word study tool of Ancient languages. Raymoure, K.A. “ma-ra-tu-wo”. Minoan Linear A & Mycenaean Linear B. Deaditerranean. “MY 602 Ge (57)”. “MY 606 Ge + fr. (57)”. “MY 605 Ge + 607 + fr. [+] 60Sa + fr. [+] 605b + frr. (57)”. DĀMOS: Database of Mycenaean at Oslo. University of Oslo. ^ “Old English Plant Names”. Retrieved 16 January 2013. ^ “Foeniculum vulgare“. Germplasm Resources Information Network (GRIN). Agricultural Research Service (ARS), United States Department of Agriculture (USDA). Retrieved 10 December 2017. ^ “Green Fennel Seeds”. Retrieved 24 June 2014. 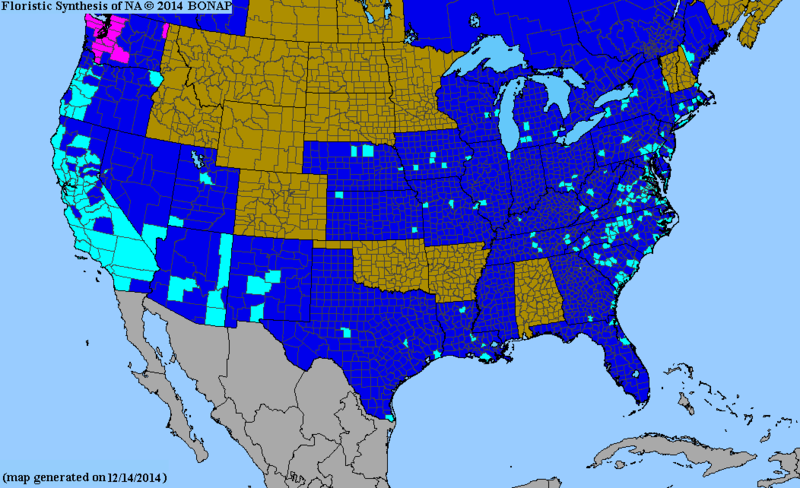 ^ “Biota of North America Program 2014 county distribution map”. ^ “Aalborg Taffel Akvavit”. www.diffordsguide.com. Retrieved 8 November 2017. ^ Drinkers, The Thinking (8 November 2016). “Aquavit: this winter’s hottest spirit”. The Telegraph. www.telegraph.co.uk. Retrieved 8 November 2017. ^ “Fennel Pollen: Culinary Fairy Dust”. The Wall Street Journal. 23 March 2012. ^ a b M. G. Kains (1912). American Agriculturist (ed.). Culinary Herbs: Their Cultivation Harvesting Curing and Uses. Orange Judd Company. Archived from the original (English) on 13 April 2017. ^ Deepika Sahu (10 May 2012). “The power of five seeds”. The Times Of India. ^ “Fennel Tea Benefits”. 9 March 2014. ^ a b “Production in 2014, Crops/Regions/World list/Production Quantity (pick lists)”. UN Food and Agriculture Organization, Corporate Statistical Database (FAOSTAT). 2017. Retrieved 10 November 2017. ^ Badgujar, Shamkant B.; Patel, Vainav V.; Bandivdekar, Atmaram H. (2014). “Foeniculum vulgareMill: A Review of Its Botany, Phytochemistry, Pharmacology, Contemporary Application, and Toxicology”. BioMed Research International. 2014: 1–32. doi:10.1155/2014/842674. ISSN 2314-6133. PMC 4137549. PMID 25162032. ^ Díaz-Maroto, M. C; Díaz-Maroto Hidalgo, I. J; Sánchez-Palomo, E; Pérez-Coello, M. S (2005). “Volatile components and key odorants of fennel (Foeniculum vulgare Mill.) and thyme (Thymus vulgaris L.) oil extracts obtained by simultaneous distillation-extraction and supercritical fluid extraction”. Journal of Agricultural and Food Chemistry. 53 (13): 5385–9. doi:10.1021/jf050340. PMID 15969523. ^ Uusitalo, L; Salmenhaara, M; Isoniemi, M; Garcia-Alvarez, A; Serra-Majem, L; Ribas-Barba, L; Finglas, P; Plumb, J; Tuominen, P; Savela, K (2016). “Intake of selected bioactive compounds from plant food supplements containing fennel (Foeniculum vulgare) among Finnish consumers”. Food Chemistry. 194: 619–25. doi:10.1016/j.foodchem.2015.08.057. PMID 26471600. Chisholm, Hugh, ed. (1911). “Fennel” . Encyclopædia Britannica (11th ed.). Cambridge University Press.